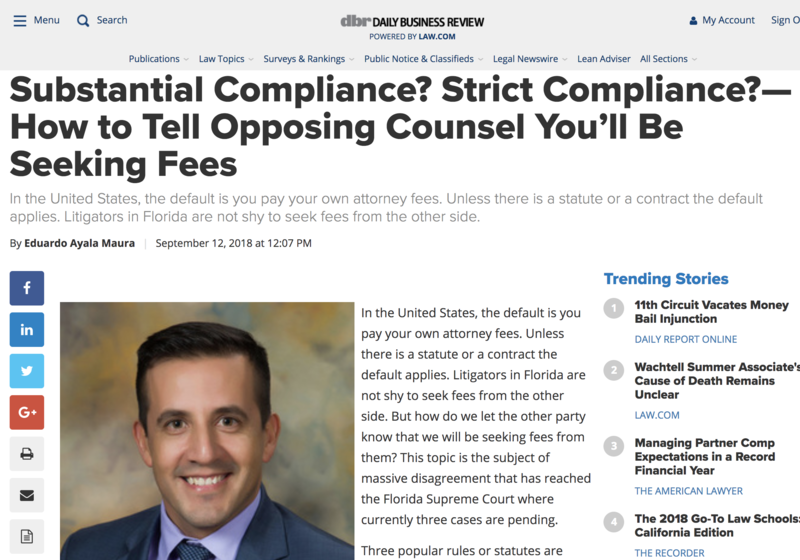 The Daily Business Review, a leading page for legal news in South Florida, published Ayala’s attorney Eduardo A. Maura article about the rules regulating service of proposals for settlement and motion’s for sanctions to seek fees from the other party. The article is titled “Substantial Compliance? Strict Compliance? 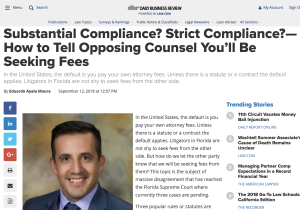 —How to Tell Opposing Counsel You’ll be Seeking Fees”, is a short version of an article written by Attorney Maura regarding the status of current law addressing Rule 2.516(b) of the Florida Rules of Judicial Administration. The rule that regulates service of legal documents on attorneys. The rule, and its application to motion or proposals intended to seek attorneys fees, has been the subject of a lot of litigation with three cases currently pending in the Florida Supreme Court.